Matzah cover made by my Great Grandmother Chava. Watching the Antiques Roadshow, a PBS show, is one of my favorite television experiences. I started watching it with my parents years ago. Whenever they came to visit, this was one of their favorite shows. They got me hooked on it! I love learning about different items of furniture, jewelry and knick knacks. It is a history lesson along with seeing the beautiful items. But every once in a while, someone brings in a special ephemeral item: photos, letters, a diary. In my opinion, these items should really be in a museum, some place where researchers and students and others can see the items and learn from them. It drives me crazy. I even say it out loud. Occasionally we find out that the family did donate the item. Like when a family had the musical notations of the “Star Spangled Banner.” They donated it to a museum, and that made me feel good! I often wondered: would I be able to do that. Would I be able to donate a family treasure to a museum? The answer is yes. When my siblings and I were cleaning out our parents’ apartment we found two items that my brother, sister and I all wanted, but knew something special had to be done with them. One was a program from the 1930s for a benefit to help the Jews of Europe, the other was a cookbook in English and Yiddish to help immigrants learn to cook American meals. My sister contacted the Museum of Jewish Heritage in Battery Park and asked if they would want these documents. The answer was a resounding yes. So we donated them. This way they will survive, and others who might be doing research or want to know about life for immigrant women would have these items. They will be protected. The curator told us that they had only seen one other program like ours, but it was from a Chicago event. Ours was from a New York City event. The three of us were glad that we made this decision. I recently made another decision to donate. 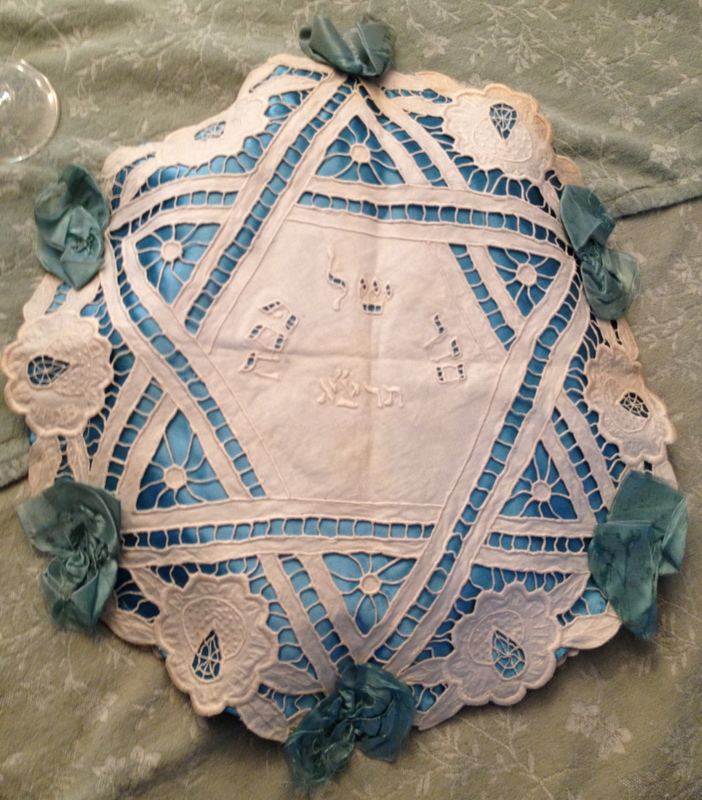 I am donating the matzah cover my great-grandmother Chava made in 1901 to the same museum. I have thought about this for several years, and decided it was the best choice for this family heirloom. The matzah cover is made of beige linen and a teal silk. I think the silk was originally blue. On the matzah cover my great grandmother embroidered the date she made it in Hebrew letters and the words: “Seder shel Pesach” (Seder of Passover) in Hebrew. It has beautiful cut work embroidery made into a Jewish star (Mogan Dovid) with embroidered roses along the edge. My mother gave it to me about 25 years ago for several reasons: first because I was named for my great grandmother; second, because I also do embroidery; third because my parents would come and spend the second night of Pesach with me; fourth because my daughter is the oldest grandchild. I think they thought I would pass it on to her. The matzah cover was made in Galicia before the First World War. I think it was made for my grandfather’s first birthday, as he was born in 1900 on the first of Nissan. It came to the USA in 1932. My Grandmother took my mother, then age 2, and her brother, age 5, to Europe for six months. They stayed with my great grandparents. And my great grandmother gave the matzah cover and some other family items to my grandmother to bring back to the United States with her family. At some point my grandmother gave the matzah cover to my mother. And then it became mine. I used it every year for Passover. I would cover the matzah on the table before the meal. But as soon as the food and wine came out, I would switch to a matzah cover that I made. I did not want anything to happen to this cover because I was not sure how I could ever clean it without destroying it. As the years have passed, it has become more and more fragile. I want it to survive. My great grandmother did not survive. She and most of my grandfather’s family perished in the Shoah. This is the only religious item she made that remains. I also thought about donating my matzah cover because I had a mild infestation of fabric eating bugs. Ugh. They are gone now. And the matzah cover is safe. But part of me was worried. What if they had reached the cover? Perhaps there is something better I can do with this item? First I asked my daughter how she felt about my donating this item. She thought it was a great idea. So I contacted the museum and the woman who helped us with the other donations. She asked for photos. And then she said yes, they would like the matzah cover for their collection. She told me that the matzah covers they had that were that old were all stained and in disrepair, while mine was in wonderful shape. Which is true. I told her I wanted to use it for one more Passover before I donated it. 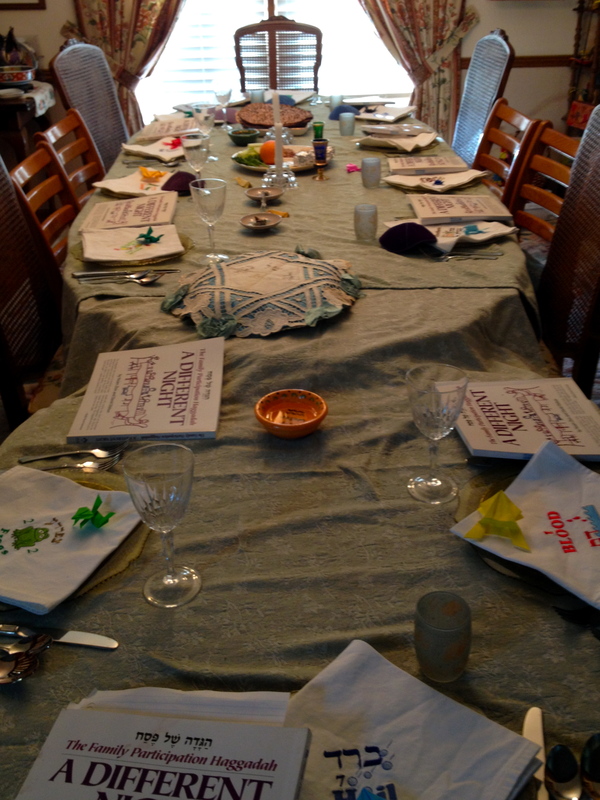 2014 Passover Seder. Matzah cover in the middle of the table. She asked that I take photos of it in use. Which I did and you can see here. In August I will take my matzah cover from Kansas back to New Jersey, and then to its new home at the museum. I hope by sharing it with so many people, it will have continued life, and perhaps help people understand how extraordinary Jewish life was in Europe before the Shoah. I donated the matzah cover on August 12, 2014. Thank you! Hope you are feeling much better. Love and hugs.